BRIDGETOWN, Barbados (BGIS) — Arrangements are being made to have doctors and nurses from Barbados travel to Dominica to provide much-needed assistance. 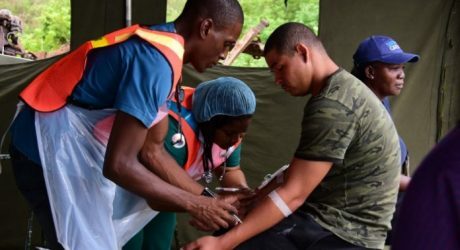 This is according to Dr Brian Charles, who is in Dominica to provide primary assessments for the health care services and the hospital there, and to work alongside the Barbadian military personnel. Dominica remains in a state of emergency after it was devastated by a category five Hurricane Maria on September 18. Charles stated that there was an urgent need for artisans, medical and nursing personnel to provide much needed care for those requiring assistance. “The [Princess Margaret] hospital has been badly damaged… it is about 70 percent destroyed, but it is running somewhat,” he stated. However, he lamented the fact that the hospital’s accident and emergency department had very limited function, as the institution had no power, water, operating theatre, X-ray or CAT scan departments, laboratories or blood bank. “Our appeal right now is for assistance to get those up and running soon,” he urged. Charles reported that there were currently five people who needed to be medevaced from the hospital’s accident and emergency department. However, the physician noted that the Roseau Polyclinic was operational after sustaining minimal damage, while the Portsmouth and Marigot health centres were also functioning but with limited staff. “We have been unable to reach any of the other health centres at this point,” he added, explaining that blocked roadways were hindering efforts to reach persons in remote areas.